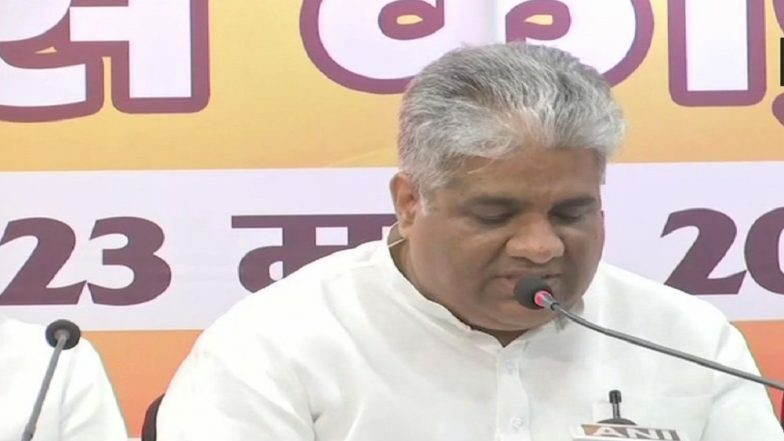 Patna, March 23: The National Democratic Alliance (NDA) on Saturday released the list of candidates for 39 Lok Sabha seats in Bihar at the state Bharatiya Janata Party (BJP) office in Patna. Union minister Ravi Shankar Prasad will contest from Patna Sahib Constituency on the BJP ticket. This seat was previously held by Shatrughan Sinha. The saffron party who is contesting on 17 seats has also given a ticket to Rajiv Pratap Ruddy to fight from Saran, while, union minister Giriraj Singh will contest from Bigusarai. According to the seat sharing agreement in Bihar, the BJP and Nitish Kumar led Janata Dal-United (JDU) will contest on 17 seats each, while the Lok Janshakti Party (LPJ) will field its candidates on six seats. The JD-U will contest from Valmiki Nagar, Sitamarhi, Jhanjharpur, Supaul, Kishanganj, Katihar, Purnia, Madhepura, Gopalganj, Siwan, Bhagalpur, Banka, Munger, Nalanda, Karakat, Jahanabad and Gaya. BJP 2nd & 3rd List of 37 Candidates For Lok Sabha Elections 2019 Out: Sambit Patra to Contest From Puri; Check Constituency-Wise Names Here. The BJP will contest from Purvi Champaran, Paschim Champaran, Sheohar, Madhuvani, Darbhanga, Muzaffarpur, Saran, Ujiarpur, Begusarai, Patna Sahib, Pataliputra, Arrah, Buxar, Sasaram Aurangabad, Arariya, Maharajganj. The LJP would contest from Vaishali, Hajipur, Samastipur, Khagaria, Jamui and Nawada. However, the LJP has announced only five candidates till now. Lok Sabha Elections 2019 Schedule: Voting In 7 Phases From April 11 to May 19, Counting And Results On May 23; Check All Dates For General Elections. Meanwhile, the Mahagathbandhan headed by the RJD-Congress combine released their Bihar seat-sharing pact for the upcoming Lok Sabha elections 2019. As per the agreement finalised by the six-member coalition, the Rashtriya Janata Dal (RJD) would take the lion's share of 20 seats. The Congress would field its candidates in the remaining 9 constituencies, whereas, Upendra Kushwaha's Rashtriya Lok Samata Party (RLSP) will be fielding its nominees in 5 seats. The Elections in Bihar will take place in seven phases from April 11 to May 19. The counting of votes will take place on May 23.